Today’s broadcast of “it’s Too Damn Early” was fantastic. 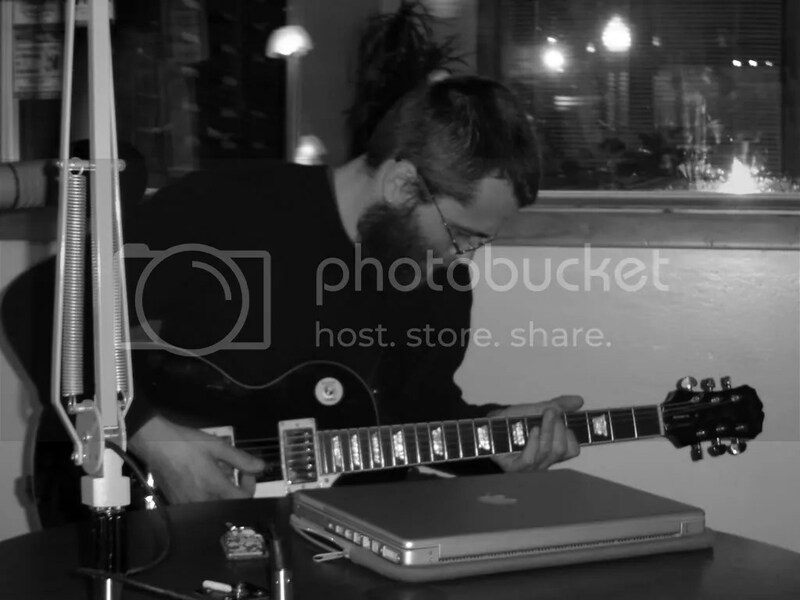 Ambient/drone guitarist P.D. Wilder played two live sets in the WDBX “Hi-Life Room” (as I call master control) and of course, a lot of good music was broadcast as well. I was able to give some more time to the Edgetone Records group Eddie the Rat, as well as a nice long set of Dan Joseph Ensemble works from the “Archaea” album. However, the best part of the show was just having a nice “behind-the-scenes” conversation with Wilder, a touring improvisational musician. We swapped stories about our various motivations for abandoning (and of course, coming back to) making music; our hopes for cultivating interest and understanding about experimental works in our respective areas, and the general “who’s on what label” so necessary to keeping up in today’s often super-obscure CDR label scene. 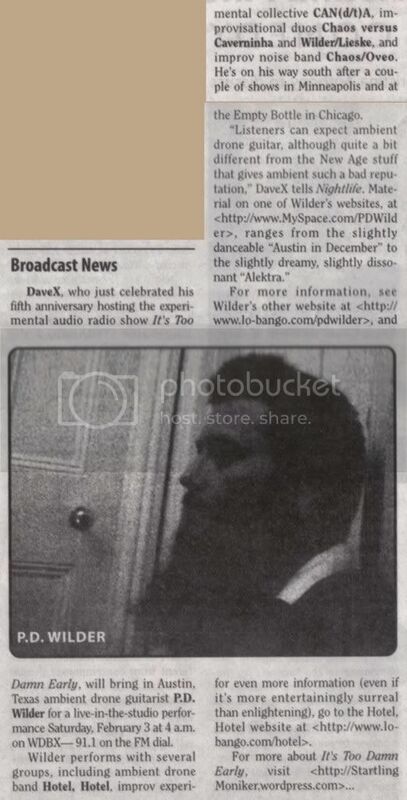 On a super-cool note, The Carbondale Nightlife (a local entertainment newspaper) published a short write-up noting “It’s Too Damn Early’s” 5th anniversary, and information about Wilder. STARTLING MONIKER even got a brief mention near the end. Thanks, Nightlife! As a small service to STARTLING MONIKER readers, I am making a complete recording of this broadcast available for the next six days through the slightly more offbeat “Senduit” website. 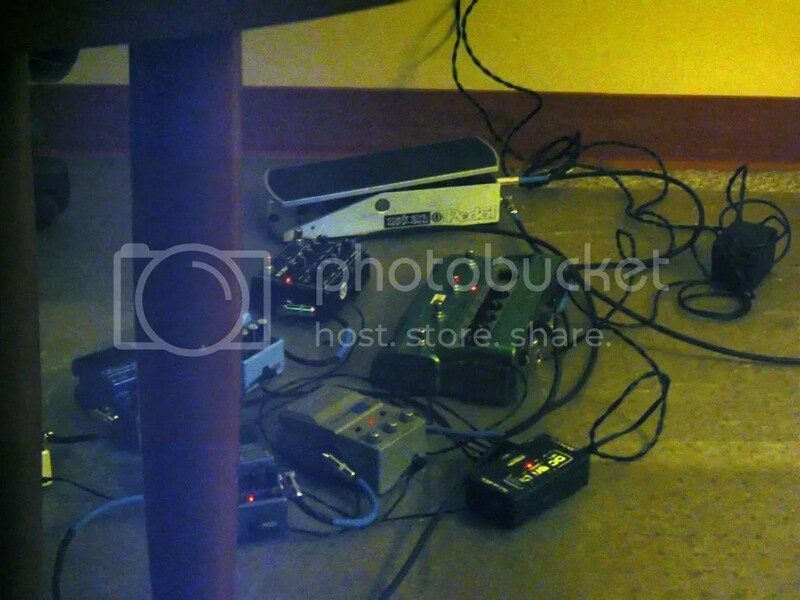 The recording is taken directly from WDBX’s streaming broadcast, as a single 64kbps mp3 track. It is by no means as good a quality as purchasing any of these albums yourself, which I strongly urge you to do. To download, simply click here. For the last remaining dial-up afficianados, here is a playlist. Feel free to use your imagination to recreate the show in whatever quality or format you wish. This entry was posted on February 3, 2007 at 11:30 pm and is filed under Artist Interviews, avant-garde, experimental, experimental music, music review, Radio. You can follow any responses to this entry through the RSS 2.0 feed. You can leave a response, or trackback from your own site.